What’s your unfair advantage in learning Italian? | Speak Italian Magically! « A free Italian audio course for YOU! What’s your unfair advantage in learning Italian? February is usually the month that I dedicate to my self and my personal growth (and to my family as well;-). And this is the time when I read about subjects that I don’t usually read about. 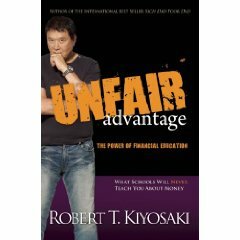 This time I read the book Unfair advantage by Robert Kyiosaki. Who’s Robert Kyiosaki? He’s a businessman and writer about interesting books about financial intelligence (Rich Dad, Poor dad among others). I don’t work for money. I dedicated all my life to serve others. […] The more people I serve , the more effective I become”. “Io non lavoro per il denaro. Ho dedicato la mia vita al servizio degli altri. […] Più persone servo, più efficace divento”. 1. Reciprocity: give and you’ll receive / Reciprocità: dai e riceverai. 2. Learn to give more. / Impara a dare di più. 3. Have a leverage effect on the power of the financial instruction that increases in geometrical proportion / Abbi un effetto di leva sul potere dell’istruzione finanziaria in proporzione geometrica. “Returns are minimal in spite of massive effort at the start, yet returns can be massive with minimal effort over time. Let me tell you about another important point that Kyiosaki writes about. 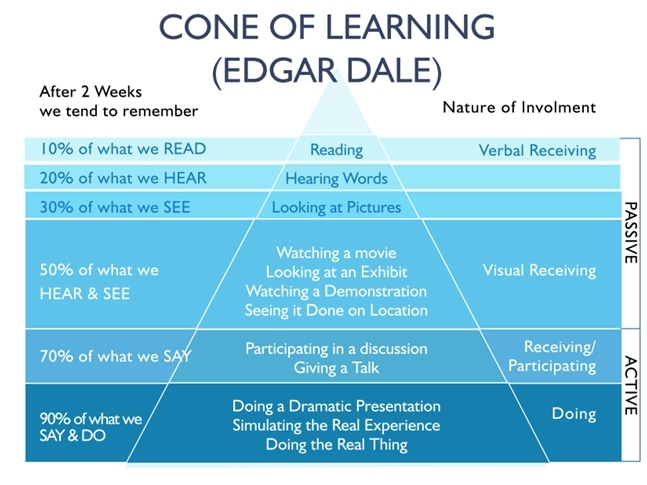 The cone of learning by Edgard Dale. I actually hadn’t read about this, so for me it was a great thing to read about. The more passive you are, the less you learn. The more active you are the more you learn. MMMM….How can I correlate this with language learning? I already know that some authors talk about what is called silent period…(Marvin Brown and Vera F. Birkenbihl)…and they do affirm that if you want to really acquire a language and especially the proper pronunciation even if you are more than 6 years old, you need to do a lot of passive listening of comprehensible input (or listening in a relaxed way as I let you do in Speak Italian Magically and Awaken your Italian). I also agree on what is said on the cone of learning…. So what is my conclusion? That after doing a lot of passive (or relaxed) listening of comprehensible input (i.e. : Italian that you really comprehend), you really need to be active and SPEAK!!! You can come to Italy or you can talk to any Italian through Skype…Or you can make some role play (like the ones that you usually do in a school that uses the communicative approach). Or you can also do some shadowing (See Prof. Arguelles). But what’s more important…HAVE FUN WHILE LEARNING AND SPEAKING ITALIAN!!! And you, what do you think about all this? Questo articolo è stato pubblicato in 16 febbraio 2012 alle 10:27	ed è archiviato in The science behind learning Italian. Tagged: , cone of learning, Fuller, Kyiosaki, unfair advantage. Puoi seguire qualsiasi replica a questa discussione tramite il RSS 2.0 feed. Puoi lascia un commento, oppure trackback dal tuo sito.